Although I had been interested in interiors from about six years old, I didn't start collecting antiques until I was 25, when I was hired to work in the public relations department of the Greenville County Museum of Art, known today for housing the world's largest public collection of watercolors by iconic American artist Andrew Wyeth. 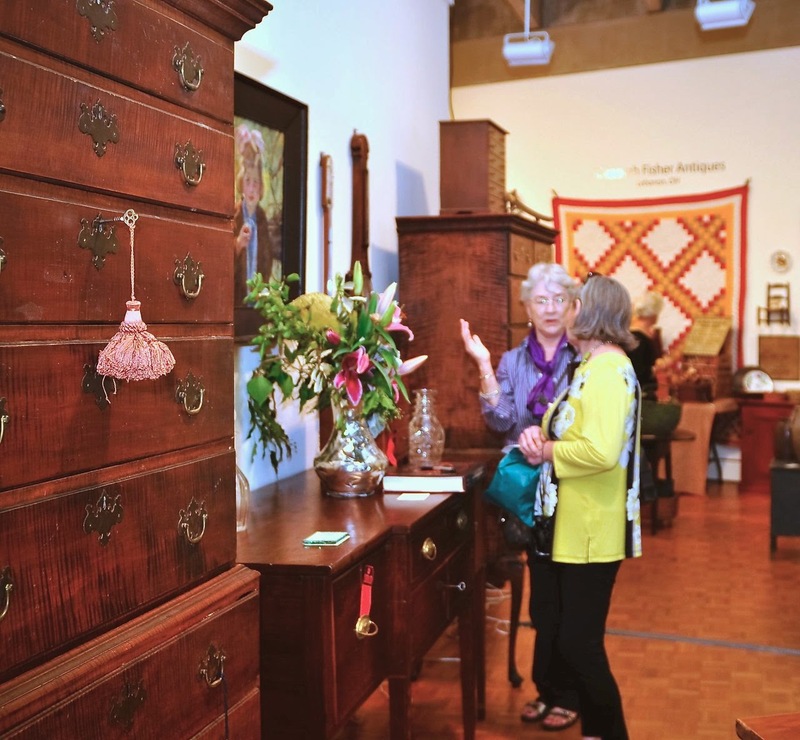 In addition to its permanent collections, traveling exhibitions, and educational programming, the museum is known for its signature antiques show, which was in its infancy when I started there. Working on the publicity for the show, I had the privilege of getting to know several museum volunteers, including two women about 15 years my senior who not only loved the museum and the idea of raising funds to bring more art to Greenville, but also had a passion for collecting. They must have sensed the dormant collector in me because each invited me to her house so that I could have a look at her antiques. And one of them, who has been my mentor in several ways, even invited me to spend a day antiquing with her. Over the years, I have learned so much from her, but the best advice she gave me was: If you add one good piece of antique furniture each year, you'll have a great collection by the time you're 40. Of course, when I was 25, the age of 40 seemed so far away. And today, it still does--only in the opposite direction! 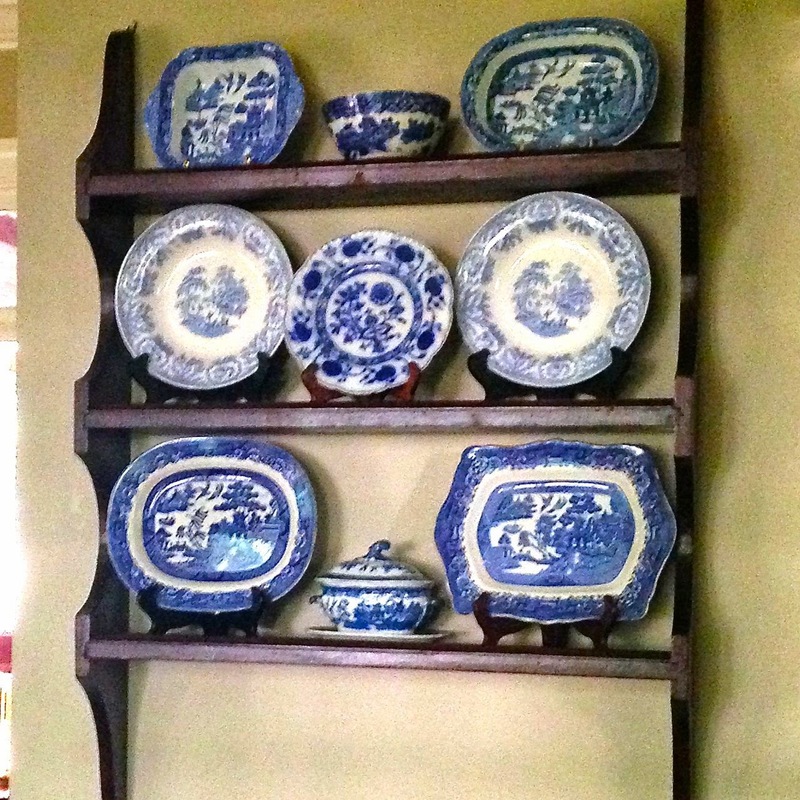 I followed her advice and it turns out, my mentor was absolutely right--our house is pretty full of good "old stuff," as collectors often refer to antiques. I still have a few items on my wish list, but for the most part these days I'm collecting smalls. finding it, remembering it was on my list, texting me photos, and working out the transport for me. One of my more recent passions was lit by one of my favorite bloggers, who sadly hasn't posted in a long time. 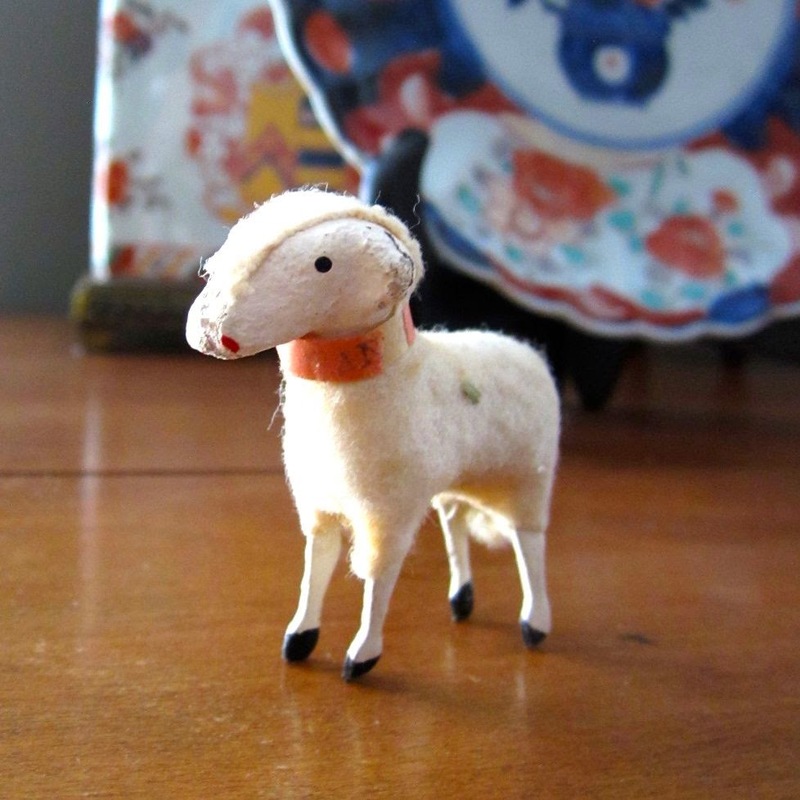 When the imitable Reggie Darling wrote about his collection of vintage sheep and how he displayed them at Easter, I was inspired and started reading about them and collecting them right away. 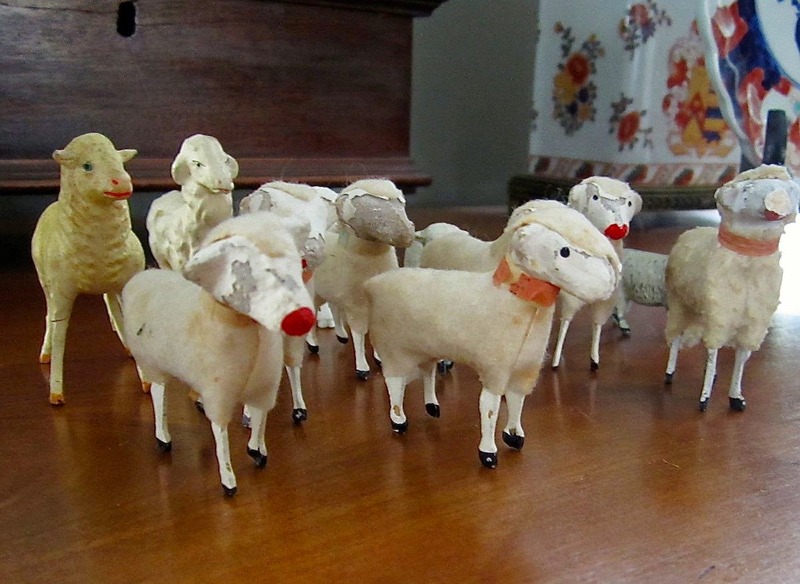 Known variously as Putz sheep or stick-leg sheep, these wooly lambs were made in Germany during the first part of the 20th century. They were typically sold in sets to be used in decorative nativity scenes. Moravian villagers, who settled near Bethlehem, Pennsylvania, and Salem, North Carolina, first brought the custom of nativity scenes and decorative Christmas villages to the United States. Putz is not, as I first thought, the name of a manufacturer, but rather derived from the German putzen, which translates "to decorate." It's easy to see that these fragile little lambs have suffered some wear and tear over the years. I like to attribute that to chubby toddler hands moving them around nativity scenes. If you look carefully, you'll see that not all the sheep in the flock are stick-leg sheep. That's because when I pop into an antiques shop or stop at a booth, and the dealer asks if I'm looking for anything in particular, I usually ask if he or she has any stick-leg sheep among other things. Often, fragile items like these are kept in cases or even not on view at all. Frequently dealers know exactly what I'm talking about. 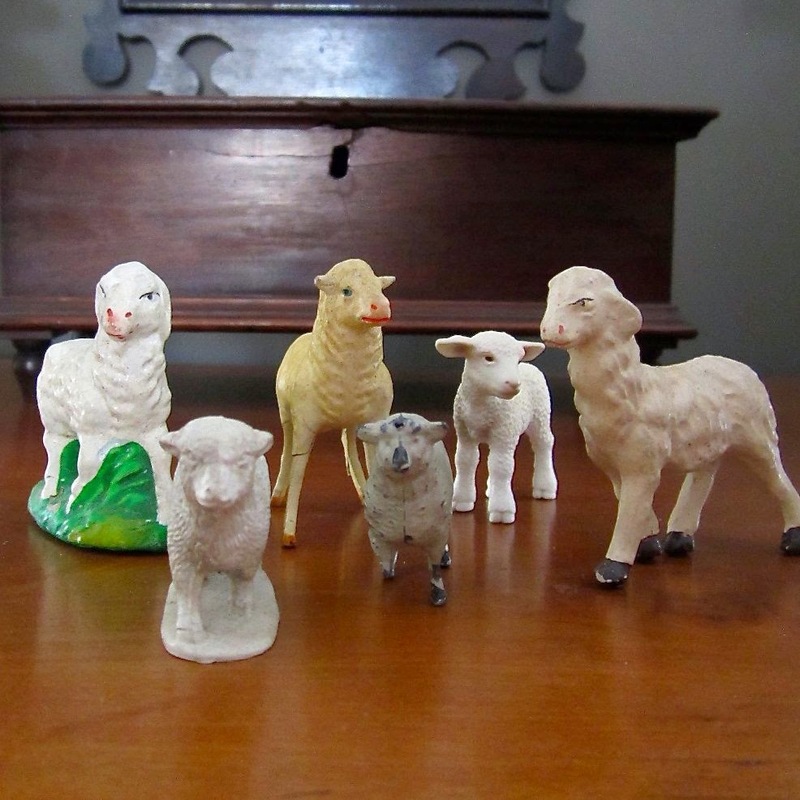 Sometimes, though, a dealer will pull out a little lamb from an old nativity scene or even a child's farm set. The price is usually very low, and so I buy it. 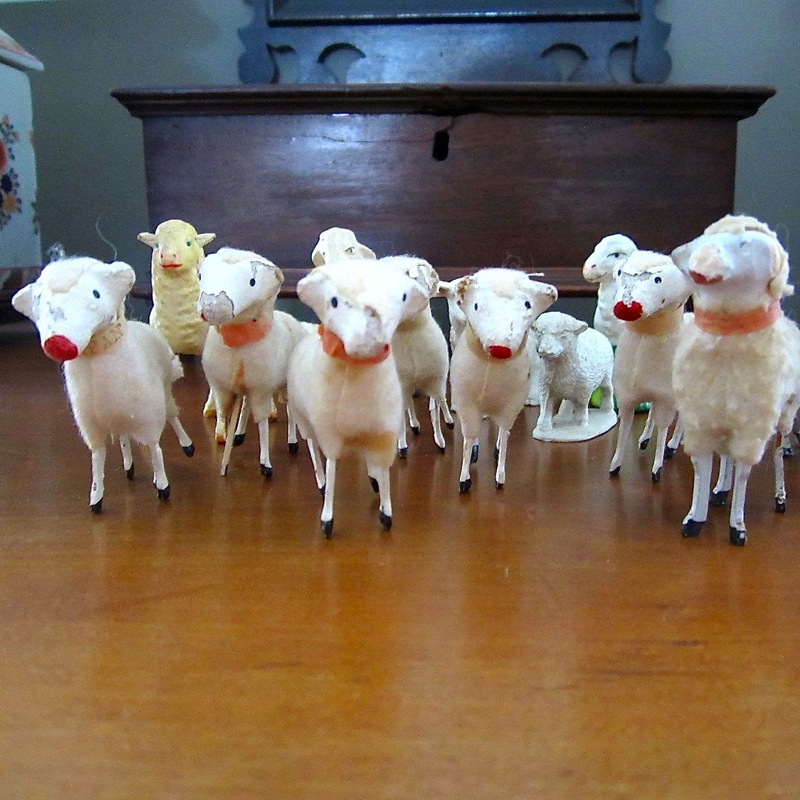 The Mister calls this a "pity purchase," and I guess he's right, but I like these sheep, too. Even the reclining ones are okay, although I don't display them with the standing flock. Here's the flock in its entirety. I'm hoping to add a couple of lambs this spring. 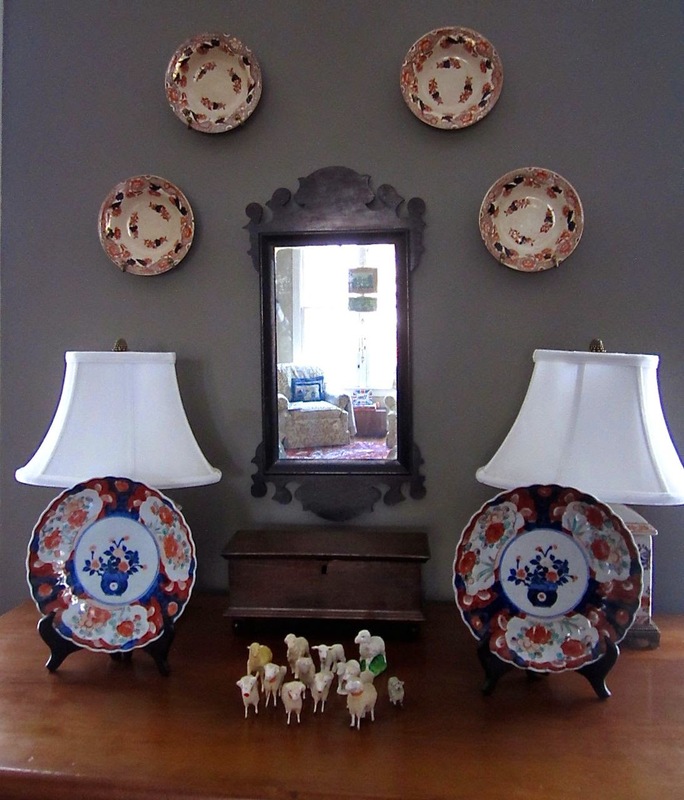 Decorating with lambs and sheep seems appropriate at this season of the year. Of course, along with the chicks and ducks and bunnies, lambs remind us of springtime and new life. 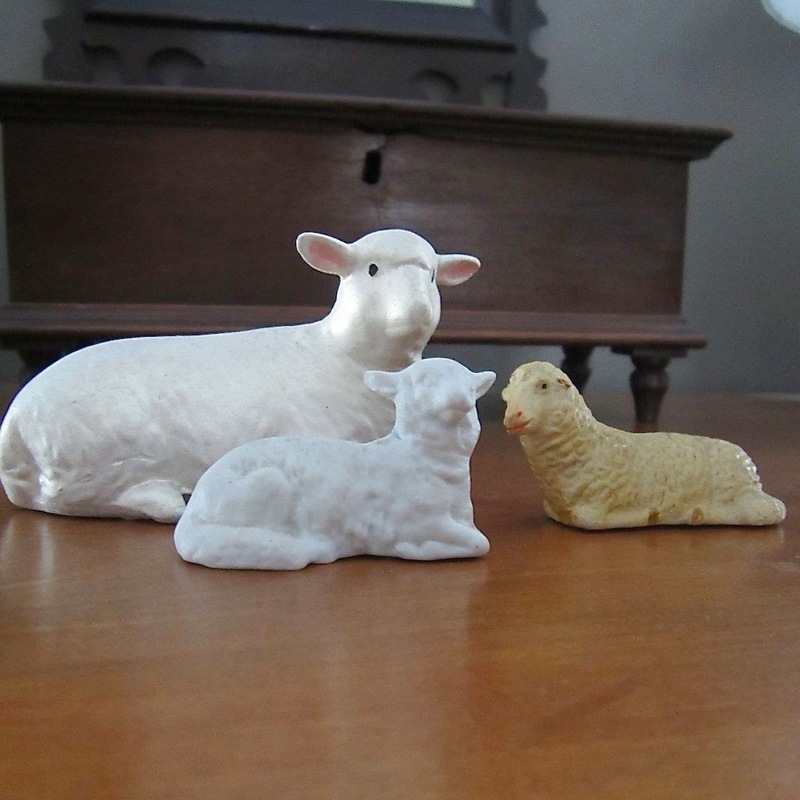 Lambs and sheep, in particular, though, remind me during Lent that "All we like sheep have gone astray." I like collecting these forgotten little sheep and remembering with thanksgiving the parable found in the book of Luke, chapter 15. Do you add any special decorations this time of year? I have some stick leg sheep. I hope you enjoy them as much as I do mine!